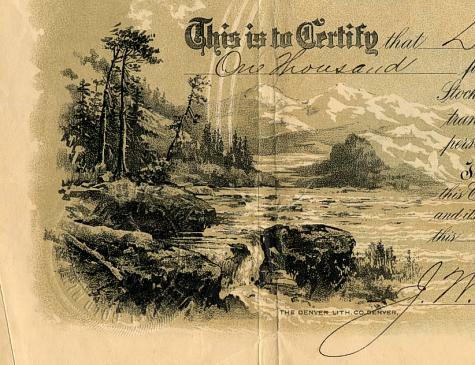 Beautiful certificate from the Sentinel Gold Mining Company issued in 1896. This historic document was printed by Denver Litho Company and has an ornate border around it with a vignette of a mountain scene. This item has the signatures of the Company's V. President, M. J. McNamara and Secretary, J. W. Moore and is over 113 years old. Light toning and very minor seperation on one fold. The company operated the Valley View, Little Gold Bug, Fairvlew, Golconda and Stanley claims.